1000Bulbs.com is on the forefront of indoor commercial and industrial lighting as linear and low/high bay fixtures are forecasted to have the largest energy-saving probability in 2016. LED linear fixtures include all troffer, panel, suspended, and pendant light fixtures in either total replacement or retrofitted lighting systems. High and low bay fixtures specifically show promising statistics in extensive indoor areas such as big-box retail stores, warehouses, and manufacturing facilities. According to a 2015 report issued by the U.S. Department of Energy, linear and low/high bay fixtures account for more than 60 percent of the potential or “overnight” reductions in energy consumption should all lighting be immediately converted to LED. These two types of LED commercial fixtures have slowly been gaining ground in U.S. commercial lighting. Linear fixtures have acquired a 1.3% share while low/high bay fixtures obtained a 2.2% share in industrial lighting markets. Slow adoption to commercial applications is mainly attributed to high initial costs and lower efficacy or brightness, especially compared to today’s linear fluorescent and ballast systems. Modern fluorescents can boasts efficacies up to 108 lumens per watt. Advances in LED technology have allowed LED linear fixtures to make significant strides in these areas. For example, a 4-foot Maxlite dimmable LED wraparound fixture delivers a comparable 103 lumens per watt and 30-watt power consumption. The dimmable 4-foot Lithonia LED wraparound fixture offers 111 lumens for each of its 41 watts and can be equipped with an occupancy sensor for additional savings. Low bay and high bay LED light fixtures face similar issues. Common wattages for high intensity discharge fixtures, such as the 175-watt or 400-watt metal halide lamps, can average 4,000 to 36,000 lumens of output. This immense lumen requirement made HID lights the dominant choice since earlier generations of LEDs could not compete. More recent generations of LED fixtures provide better outputs, like the 210-watt, 20,000-lumen TCP high bay fixture or the 146-watt, 14,000-lumen Lunera LED high bay retrofit lamp. LED commercial fixtures continue to make great strides in adapting to this competitive market. Similarly, 1000Bulbs.com is committed to providing advanced, accessible, and cost-effective lighting solutions to its business customers. 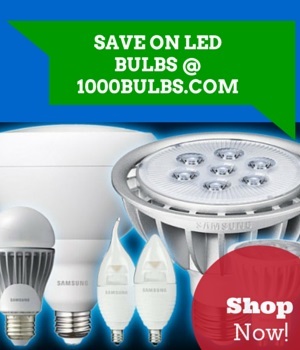 Visit 1000Bulbs.com for additional information or to find the most up-to-date LED fixtures.